Most of my new year resolutions have either come completely unstuck or are on the verge of becoming so. Except one. I am very pleased to announce that I have now finished two whole months, 40 whole days of crocheting my Sky Blanket 2016. 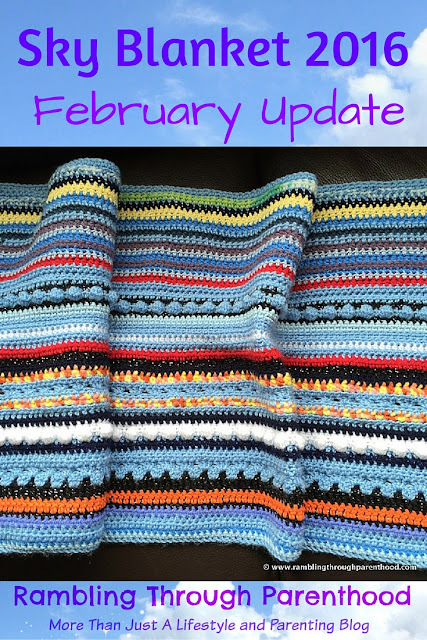 The crocheting resolution might not have completely fallen through, but this month has not been without its fair share of glitches. Unlike in January, I did not post a single Instagram progress update this month. I guess the initial euphoria of the resolutions had died down by the time we were in February. The onslaught of highly debilitating throat bugs that had me out of action for days on end did nothing to help. I did manage to post some truly spectacular sky photos though. They were the inspiration when it came to choosing yarn for the blanket. January ended on a row of sparkly white and this is what February looks like. If you are following the pattern, day 1 is the blue row right at the bottom of this picture, adjacent to the sparkly white from January. I have stuck with DCs and half trebles for a large part of this month with the exception of day 7 when I bobbled in some wispy clouds in blue. The choice of stitches reflect my state of mind and body through this miserable, malady-ridden month. I had no option but to take the easy way out, not too adventurous nor time-consuming. 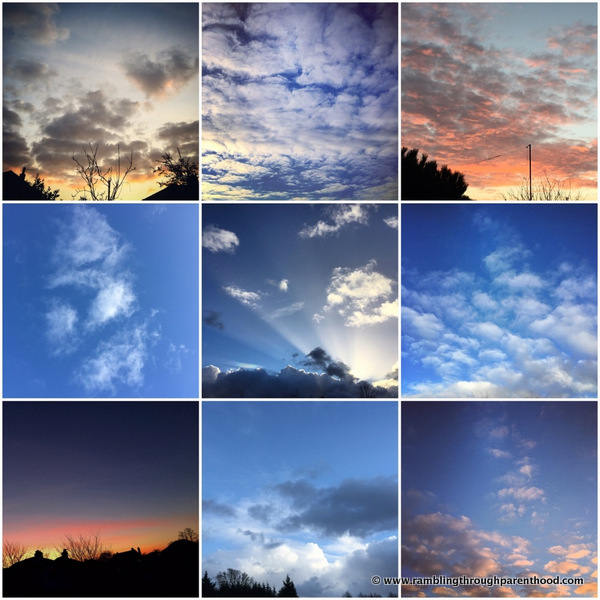 The colours, however, do justice to the pretty February skies we've been fortunate to witness. I broke out the heather, which, turns out, is my favourite so far. And the variegated blue-green to represent a fun family day out. (More on that in tomorrow's post). Here are the details of this month's pattern in case you fancy crocheting along. 27 - half trebles in variegated blue-green yarn (Patons Fab DK Aqua colour), hook size 5, to celebrate our fun day at Thomas Land with its abundance of blue and green engines. Here is how my Sky Blanket now looks after two months into this mammoth project. 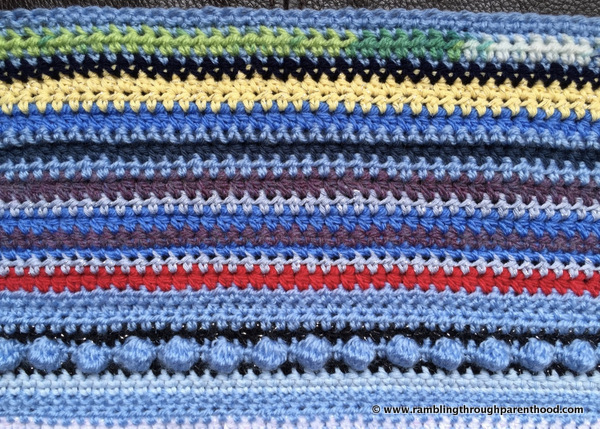 I am doing the Sky Blanket 2016 along with a large group of like-minded yarn lovers. It is being hosted by the lovely Bug Bird Bee, The Boy And Me and You Little Sew And Sew. This is beautiful! My friend is really into crochet and keeps saying she'll teach me as it's really easy. It doesn't look at all easy to me! What beautiful skies you've had! 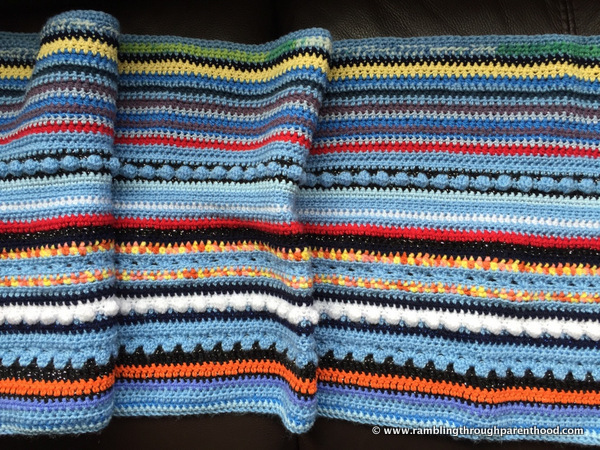 The blanket is just amazing, such a wonderful selection of colours and I love the mixture of different stitches and all the different types of yarn, the sparkly ones make it look so pretty. Oh I am so impressed with your blanket! I have been meaning for years to try and learn crochet again, I really enjoyed it as a kid but I've long forgotten how to do it. It's so nice how different things are inspiring it and I love your sky pics. Your sky blanket looks lovely,I love all the colour clashing shades that somehow tie in very well. It looks great! What a wonderful idea! I love it. But what I love the most is that you are using the sky as inspiration ... Something so simple, and something that can go largely unappreciated. I think we should all do a sky blanket!